The festival of San Blas starts on the evening of 2 February, with the traditional “velá” (vigil) and residents throw old furniture and possessions onto a huge bonfire. On the days before the celebration, the people of Montánchez make traditional confectionery such as escaldones (fritters), fried doughnuts and nuégados (fritters) with honey. 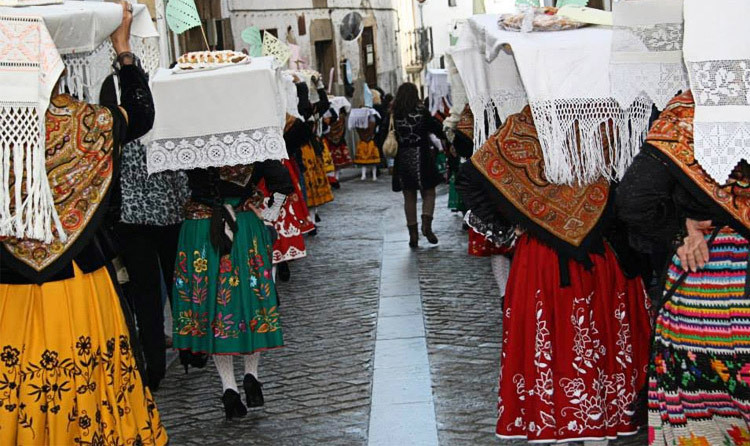 On the morning of 3 February, the village’s women dress up in traditional clothes, they place an ornate board on their head and, to the rhythm of the music, they dance the “Ramo de San Blas”, accompanied by all of the village’s residents. 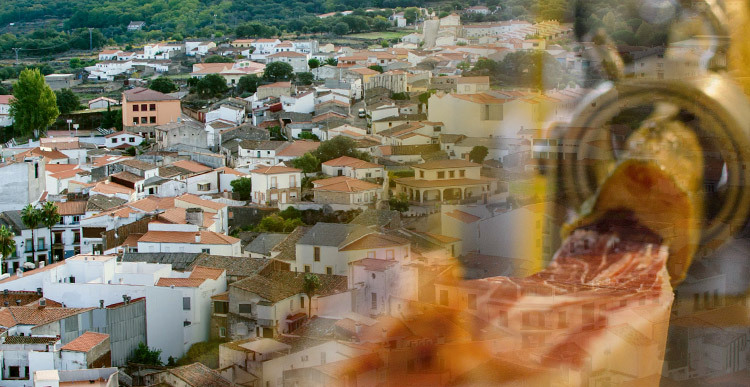 The VanderLinde Foundation, the different associations of friends of this Cáceres municipality, the Town Council and visitors alike come together to revive an ancient and unique Carnival. 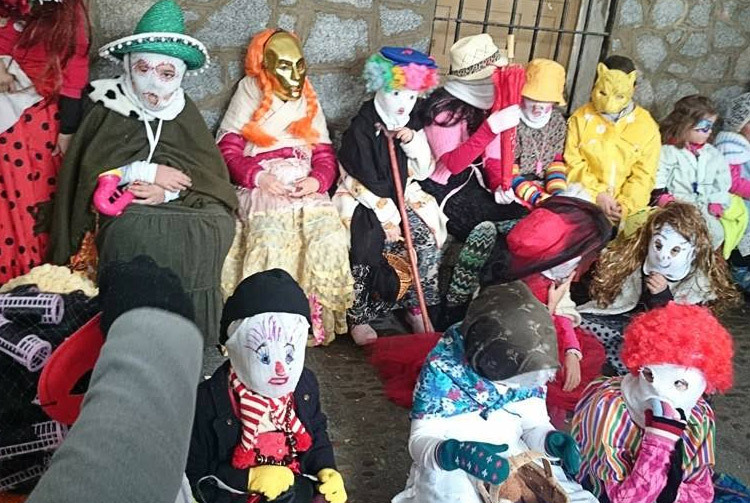 Without a doubt, the star of the carnival of Montánchez is the Jurramacho. The objective of the Jurramacho is to try not to be recognised by residents and visitors. The costume is created with unused clothes, combining different garments and accessories such as the traditional mask made with the cloth used to wrap up its treasured cured hams. The Jurramacho costume is extremely eye-catching: old, unused clothes are used and are combined at random. During the entire carnival there is a non-stop festive atmosphere in Montánchez, both on the streets as at the village’s leisure venues. The carnival is so important in the village that not even Franco’s ban was able to suppress this lively festival. A festival in which the local food products take centre stage. The festival is focused on Iberian ham and the rest of products deriving from the Iberian pig, without forgetting the local cheeses, wines, oils and confectionery. The main activities take place in a large marquee on the village’s Plaza de España, where visitors and locals alike can try all of these high quality products. 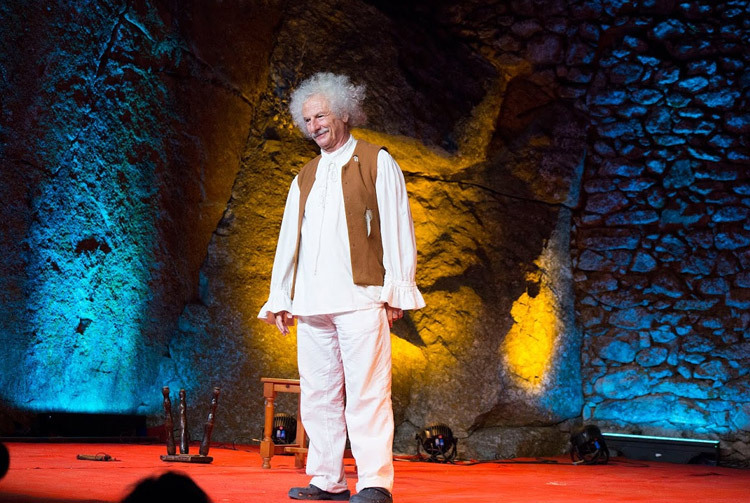 ENCOUNTERS IN MONTÁNCHEZ, DIALOGUE OF CULTURES. Without a doubt it is the cultural festival par excellence in Montánchez. This initiative arose in 2005 in order to create a meeting point between different cultures. Dance, music and cuisine can bring us closer to other worlds. There are countless figures who have visited Montánchez year after year during the famous Encounters festival. Today, it is a well-established festival that attracts visitors from across Spain. 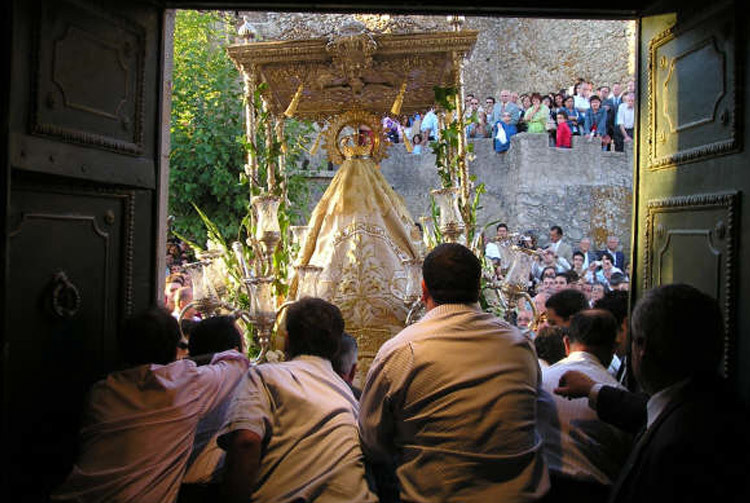 On the second Sunday of May the people of Montánchez take part in the Pilgrimage of Salor, in the municipality of Torrequemada. 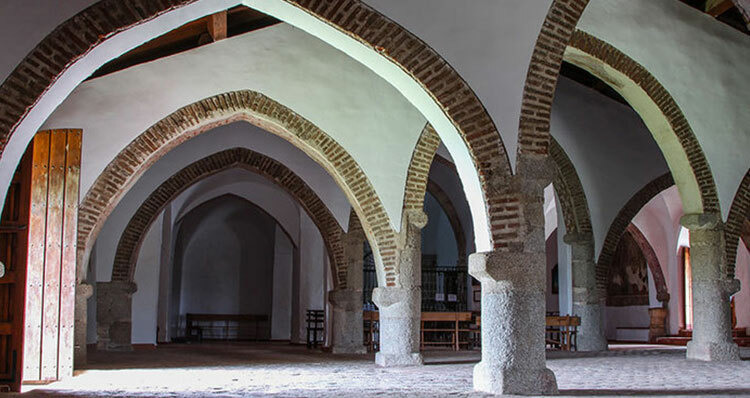 The ancient objective of this pilgrimage was to ask the virgin who lives in this 12th Century Mudejar hermitage for water. For the past few years, the celebration has taken place at a municipal estate known as the “Pocito de las Heras”. This festival takes place in July and pays homage to the patron saint of drivers: Saint Christopher (his name day is celebrated on 10 July). On Sunday morning there is a unique procession of vehicles which travel through the village’s streets and are blessed. On the weekend there are also bullfights in the traditional Montánchez style, dances and other festive activities. PATRON SAINT FESTIVALS IN HONOUR OF OUR LADY OF CONSOLATION OF THE CASTLE. The Patron Saint Festival in Honour of Our Lady of Consolation of the Castle starts 11 days before the second Sunday in September, when the Virgin moves from the Sanctuary of the castle to the Parish Church. This is the most important festival in the area, as they are held in honour of the village’s patron saint. Competitions, sports tournaments, children’s workshops and games, dances, etc. The days are full of activities and a festive atmosphere.